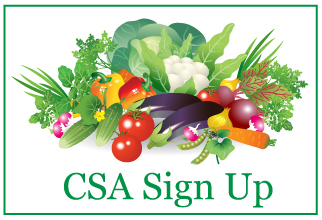 We close the sign-up form once our CSA is full for the season. We recommend signing up before May 1st. A CSA offers the opportunity to challenge American's common food system - to buy and eat food that was grown by your neighbor, your local farmer, minimally-packaged, and nurtured in ways that support the health of our planet. Community Supported Agriculture, or its more commonly used term CSA, is a partnership between a farm and a community of local CSA members. In exchange for your commitment to us, we provide you with great value, great taste, and a special relationship with our farm. 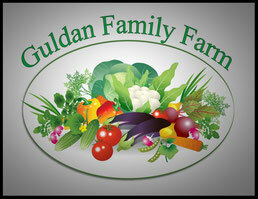 Members pay a fee upfront for a full or half share to receive a season's worth of fresh produce. For 12 weeks, each member will receive their "share" or selection of what is in season. Belonging to a CSA gives members the opportunity to be more adventurous in their cooking and eating habits as well as knowing exactly where their food is coming from. Included with the weekly share of produce is a newsletter with farm happenings, ideas and recipes for using the produce choices of that week. A CSA membership fashions a shared-risk arrangement between our farm and our members, as weather conditions or foraging animals may affect the yield of certain crops. With more than 25 years of growing experience, however, we are committed to providing each member with value for their CSA dollars. Ultimately a CSA membership will help you in cooking healthier more delicious meals, provide you with an adventure in eating seasonally, as well as give you the opportunity to know the family that grows your food. You'll support local farmers and the local economy! We offer two choices in share sizes. A full share for one season is $400; a half share for one season is $200. Half shares are picked up weekly just as the full shares, but they include roughly half the quantity as a full share. Whether you sign up for a full share or a half share, 50 percent of the membership fee is due at sign up with the second portion due July 1. What quantity of produce should I expect in a share each week? I can't decide between a half share or a full share. We have found that most of our members with a household of two are pleased with the quantity found in a half share. Larger households, families that eat a lot of vegetables, or are preparing more than one meal per day at home, are more apt to choose the full share option. Keep in mind that every family varies in their eating and cooking habits. What's more than enough for one family may not be enough for another. To see what has been included in specific shares last year, read some of our newsletters from last season for a more detailed list of what members received each week. As an added bonus, you'll also find recipes that were included in the newsletter that week. Do I get to choose what will be included in my share each week? No, the content of your farm share is based on what's in season each week with lots of variety throughout the season being our number one goal. This is the highlight for many members belonging to our CSA. Rather than choosing the same produce week after week, members will be enjoying the opportunity and convenience of receiving their share ready for their pickup, as well as the chance to try new recipes with the vegetables found in the shares that week. We grow most of the common vegetables available for our climate and only a few not so ordinary ones that we promise we will never intend to oversupply you with. Keep in mind, however, that what is strange to one household is often times common in another! Bumper crops of some vegetables also allow members the luxury of receiving the surplus over and above their weekly share. Most times, we will have a swap box available for members to leave something and take something for those that have a strong dislike for a particular vegetable. Will my produce be washed and ready for preparation? We wash most produce when it comes in from the field. Some vegetables will appear to be perfectly clean, ready to eat. However, it is always a good idea, no matter where you get your produce, to wash it before preparation. A salad spinner will be a useful gadget in your kitchen for longer storage of your greens. Our produce is hand-picked, rinsed, packed, and stored under refrigeration until it is distributed. Oftentimes, our produce will be in your hands within 24 hours of harvesting. We have several options for pickup. In New Ulm, members will be scheduled for either a Monday morning or Wednesday afternoon pickup. On the signup form, you will indicate your choice of those two days for your regularly scheduled pickup. This year, our town pick-up location will be at Tim's house, 1226 South German Street, from 4:30 to 5:30 on Wednesdays. If you prefer to come out to the farm, you may pick up your share on Mondays between 11:00 am and noon. We are located just a few minutes east of New Ulm on Highway 14. Mankato members will choose either Tuesday or Thursday afternoons between 3:30 and 5:30 pm for your pickup at our vending stall at the Mankato Farmers' Market, located in the Best Buy parking lot, 1895 Adams Street Tuesdays, and at the Food Hub 512 N Riverfront Drive on Thursdays. What if I'm not able to pick up my share on the arranged pickup day? We have several options to work with you on those days you're unable to pick up your share. Have a friend pick it up for you. 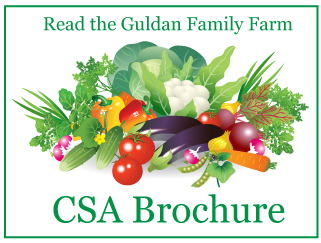 Give them the opportunity to enjoy your CSA membership or have them save it for you until you're back in town. Let us know in advance and we'll skip the week you're out of town, but provide you with a double share another week of your choosing. Call us in advance and stop at the farm to pick up on a day that works with your schedule and ours. Let us know in advance and we'll deliver that value of your share to the local food shelf the next available time they are open. What if I forget to pick up my share on my designated day? Ooops...it happens. It is evening and you realize that you're missing your produce. What do you do? If you still would like to pick up and enjoy your share for the week, you need to call Tim at 507-276-7092 by noon the following day to arrange an alternate pickup. Our e-mail is not checked on a timely basis during the busy harvesting mornings but voice mail is! If we haven't heard from you by noon, your share will no longer be available that week. Are CSA gift certificates available? Yes, we most certainly offer gift options. CSA memberships make great gifts for those who seem to have everything and especially for those who don't! Contact us for more information on CSA gifts.